Any homeowner who has required termite tenting to rid their home in Brea, California, of an infestation knows that it is an enormous hassle. Not only does it require bagging up all food and medication, but it also requires vacating the property for days. This makes the actual cost of tenting more than it seems, as homeowners have to spend additional money on accommodations during the treatment process. 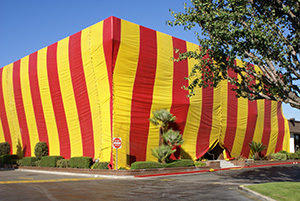 What’s more, termite tenting is not always effective against certain types of termites. For example, subterranean termites can burrow into the ground and return after fumigation is finished. After we’ve taken care of the termites in your Brea, CA, home, we can discuss other optional services we offer. With our ongoing pest control services, you can say goodbye to common pests invading your home. Or, if termites have damaged an area of your home, we can help restore it with our comprehensive wood replacement service. Contact Kilter Termite and Pest Control today to schedule a complimentary termite inspection at your home in Brea, CA, and to learn more about the advantages of choosing our services over termite tenting.